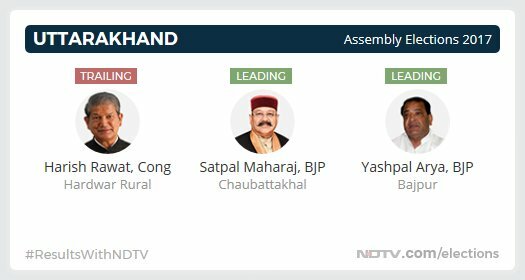 Uttarakhand Election Result 2017: Chief Minister Harish Rawat is trailing in Hardwar Rural. 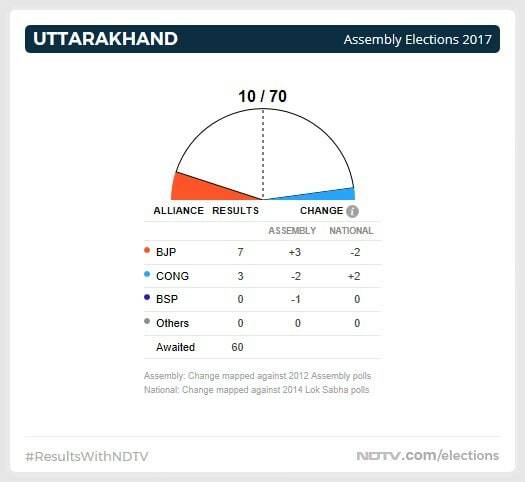 The BJP won 57 of the 70 constituencies in Uttarakhand, reducing the ruling Congress to dismal 11 seats. Following the Congress' poor show, chief minister Harish Rawat resigned. Mr Rawat contested the poll from two constituencies, Hardwar Rural and Kiccha, but failed to win either. A party needs 36 seats to form government in the state. Later, addressing the media, Mr Rawat congratulated the "Modi kranti (revolution) and EVM chamatkar (miracle)". However, he was quick to add, "I am not raising any questions" when reporters pressed him to elaborate on the comment. 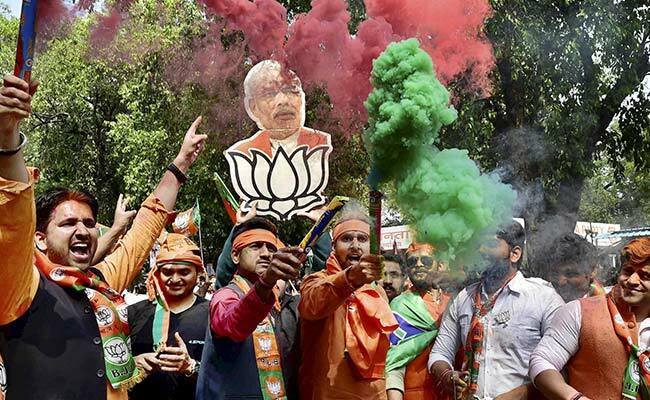 Prime Minister Narendra Modi and BJP president Amit Shah congratulated party workers and thanked the voters of Uttarakhand for the thumping mandate. 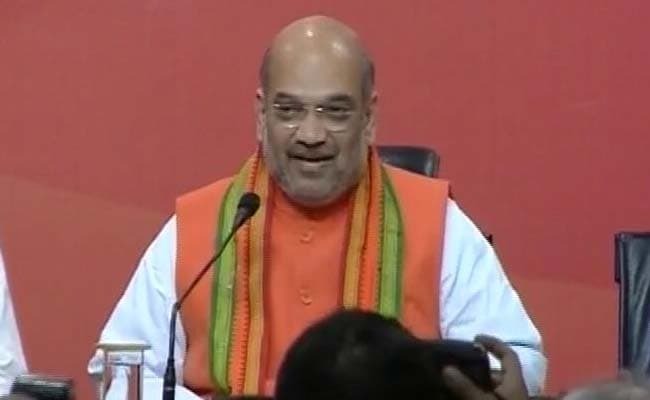 Mr Shah, addressing the media, said that the party would soon convene a meeting to decide the next chief minister. Am overjoyed that BJP has received unprecedented support from all sections of society. Huge support from the youth is gladdening. I salute the hardwork of BJP Karyakartas. They have tirelessly worked hard at the grassroots level & won the confidence of the people. Congratulations to @AmitShah, party office bearers & state units for their exemplary work in taking the party to new heights. Every moment of our time, everything we do is for welfare & wellbeing of the people of India. We believe in the power of 125 crore Indians. I want to thank the state election machinery. A question I want to raise is how much money can the central leadership of a party spend in a state. I also want to congratulate 'Modi kranti and EVM chamatkar'. I am not raising any questions. I definitely don't want to confuse you. I want to thank the media for their support in all these years. 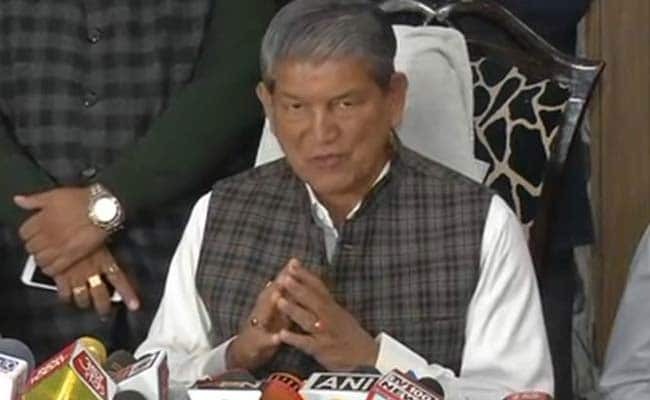 Harish Rawat resigns as Chief Minister after losing in Hardwar Rural and Kichha. 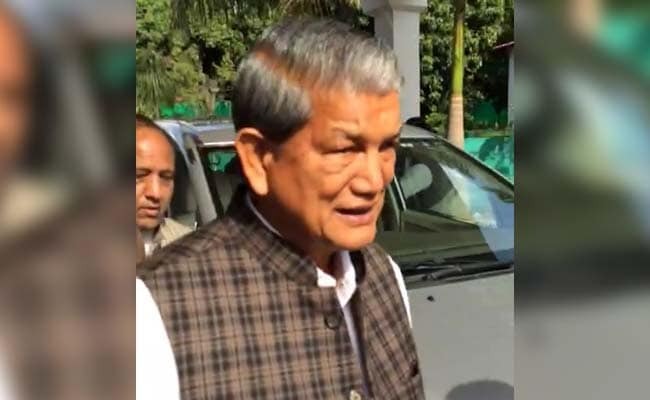 Chief Minister Harish Rawat tendered his resignation to the Uttarakhand governor today after he lost the elections in Hardwar Rural and Kiccha constituencies. The Congress also performed poorly in the state whereas the BJP has won a comfortable majority. First of all, my best wishes to one and all on the occasion of Holi. Results for all states are almost out. They are very encouraging for the BJP. In Uttar Pradesh, Uttarakhand, Manipur and Goa, we will form the government.We thank the people of these states. It is a historic mandate and we will be able to give new direction to the country's politics. Today, everyone has to admit that Prime Minister Narendra Modi is the most popular leader since independence. A lot of bad name has been given to the BJP and PM Modi. The results are a strong rebuttal to all those charges. Politics of performance has taken centre stage. Politics of appeasement has been rejected. Uttar Pradesh and Uttarakhand will come out of their sorry state of affairs. BJP accepts the responsibility with humility. 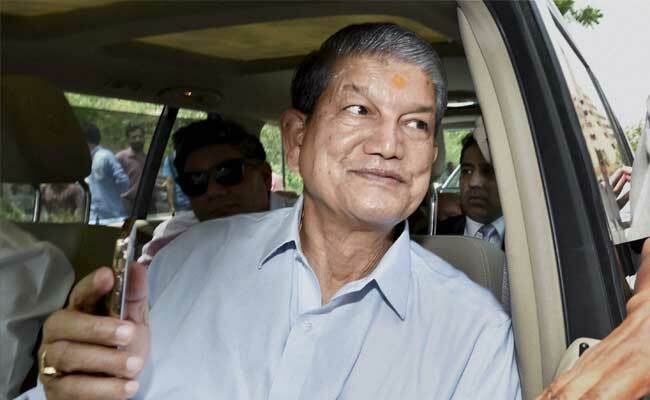 Outgoing Chief Minister Harish Rawat leaves for Governor's residence. 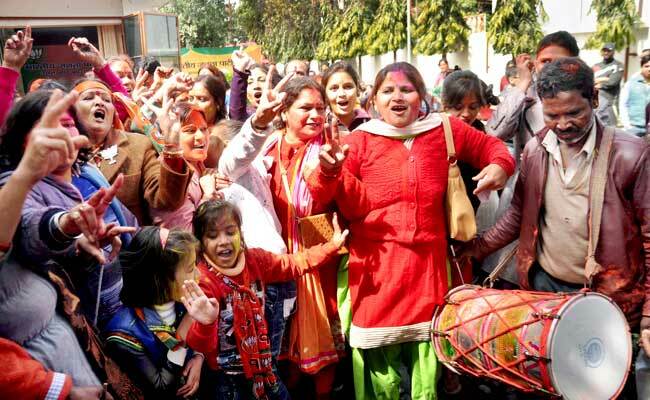 BJP workers celebrate their victory in Uttarakhand and UP in Delhi. 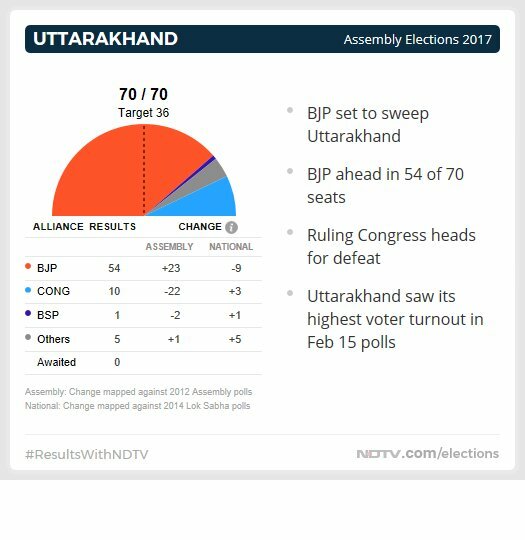 The BJP has won a huge mandate in the states of Uttarakhand and Uttar Pradesh and it is neck-and-neck in Manipur and Goa. 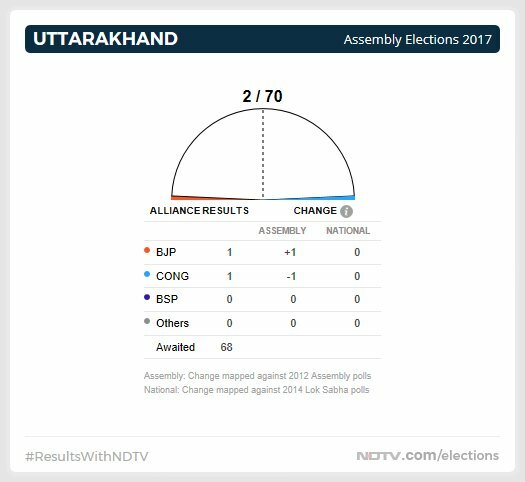 The Congress was trounced in Uttarakhand by the BJP today, leading only in 13 of the state's 70 seats at 1.30 pm. 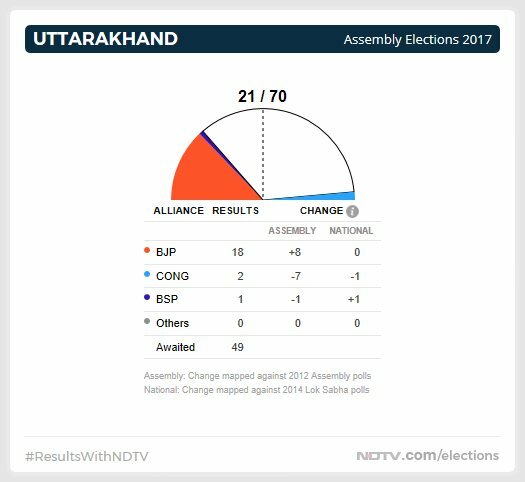 Leads at 1.10 pm show that the BJP has virtually won a massive mandate in Uttarakhand as the Congress has been decimated in the state. Chief Minister Harish Rawat won neither Hardwar Rural nor Kichha. 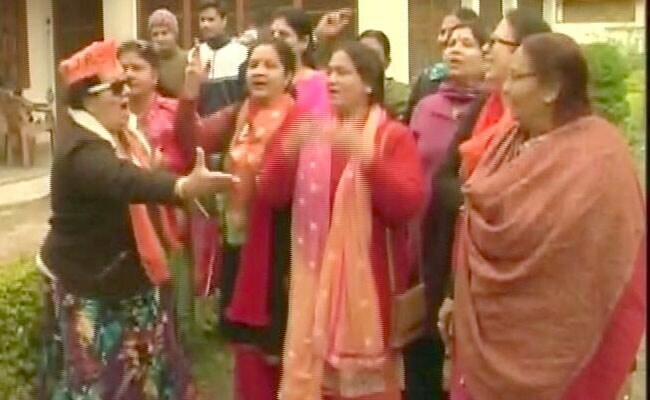 The BJP mahila Morcha celebrate the party's favourable trends in Uttarakhand. 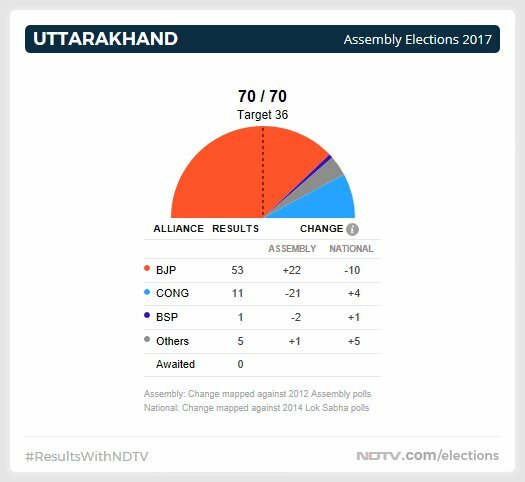 Trends seem favourable for the BJP in Uttarakhand as the party is all set to form a government. While the Congress now leads in 16 seats, it still trails the BJP. Chief Minister Harish Rawat is also leading in Kiccha. 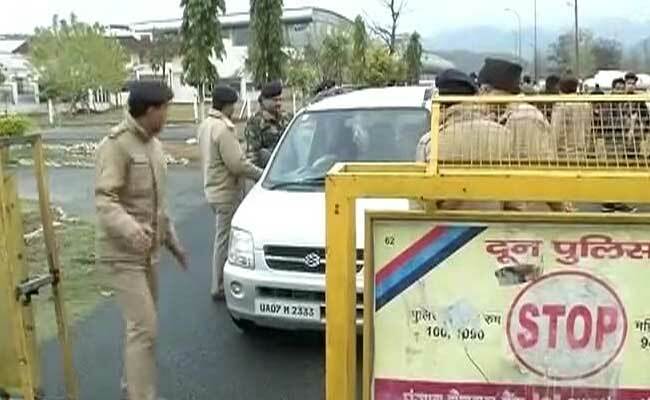 In Uttarakhand, bad turns to worse for the Congress as the BJP is all set to sweep the state. 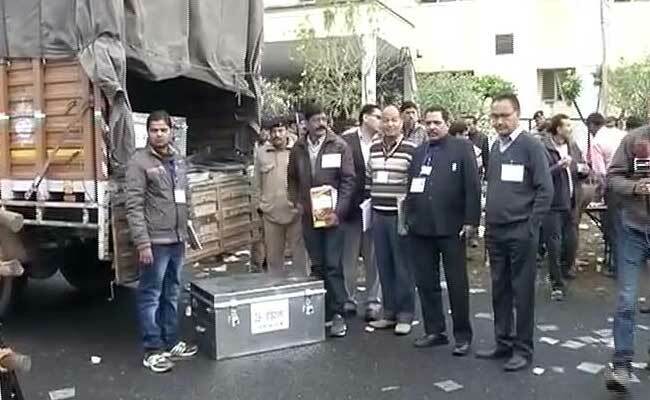 Uttarakhand witnessed its highest voter turnout on polling day and Chief Minister Harish Rawat continues to trail in Hardwar Rural and Kiccha. 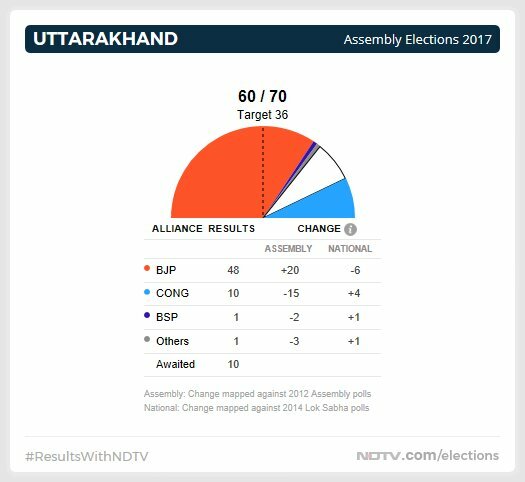 There is no stopping the BJP if current trends persist in Uttarakhand. As of 10.27 am, it is presently leading in 53 of the 70 assembly constituencies whereas Harish Rawat-led Congress is expected to win only 11. Chief Minister Rawat is trailing from his two seats - Hardwar Rural and Kichha. Chief Minister Harish Rawat is also trailing in Kiccha as Congress stares at decimation. Trends at 9.40 pm suggest the BJP winning in 48 constituencies, Congress touches double digits at 10. The BJP is presently leading in 32 seats whereas Mr Rawat's Congress is ahead in just five. The BJP is ahead in 18 seats whereas the Congress is leading in just two. As of 8.46 am, the BJP and Congress are leading in one seat each.